Since the PAM Station at Qaqqaliaq is presenting so much trouble because of the radio signal getting into our electronic system and masking the underwater sounds we had to improvise an alternative solution. It is important not to let the frustration take over your mood and understand that doing field work in the Arctic it’s at the least challenging. We are trying to obtain data while being in an extreme environment as well as quite isolated (people and supplies can only arrive to Qeqertarsuaq by helicopter at this time of the year where the sea ice coverage is between 75 and 99 %) and this means that solving problems is not allways easy and fast. Nevertheless, it is still very important to get some more clear recordings of the season, so why not to try to record from a nearby area where no big logistics would be needed? Laia went twice to the sea ice near the Arctic Station where the only necessary elements for getting clear recordings were: a tuk (to cut a hole in the ice), a thermo with warm tea, the listening backpack which contains a hydrophone, some cables, pre-amplifier, mobile power suply and recorder and of course to walk for half an hour. The first spot chosen for the recordings was located on the west side of the big iceberg. It turned out to be not the best choice for the recordings, probably due to the proximity to land, the small depth and a lot of water current noise. On the next day, Laia went to the east side of the big iceberg, where the depth is around 100 meters. 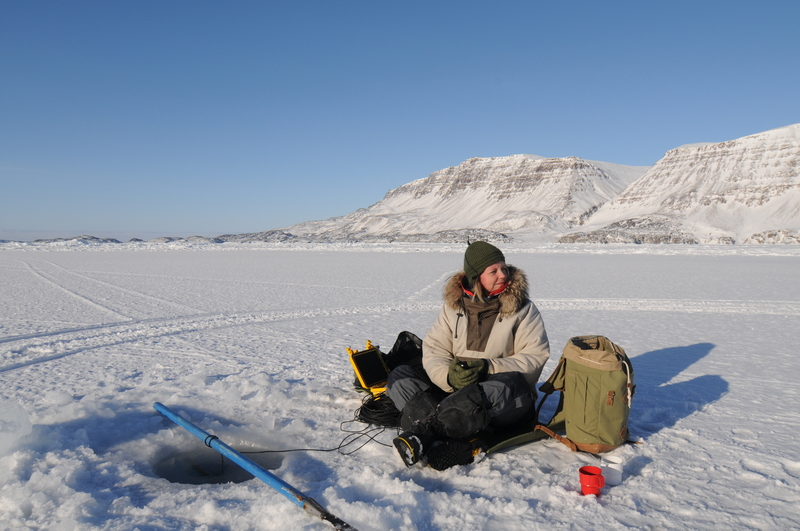 Reusing a hole in the ice where Fin and John had been fishing earlier made it more easy and after deploying the hydrophone in the water, a feeling of excitement and satisfaction toke over the frustration. This time yes! There were bowhead whales and bearded seals. 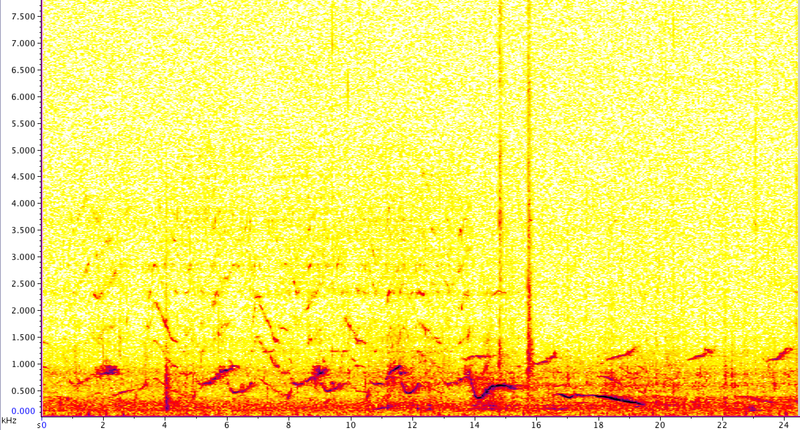 Finally some good quality recordings, there wasn’t too much water current noise and the acoustic signals sounded close and loud. Outi left Disko Bay last monday but the bowhead whale acoustic team continues its path. Right now Laia is getting a great help from John Jakobsen who is assisting in the field work. In the extreme environment conditions of Arctic it is important not to be alone when going outdoors. Qaqqaliaq Passive Acoustic Monitoring Station it is still presenting some radio noise signals as mentioned in the last post. We have received some special gear from a telecommunication technician in Aasiat which is normally used to block the strong radio noise (like the MF) from electronic systems. Laia installed the pieces into the PAM system but it seemed to be not strong enough to stop the radio from getting into the system. So, no luck with that yet..
Today John and Laia went to Qaqqaliaq to try something new. It didn’t really work but at the end the radio seemed to be a little less loud. About the Playback experiments, we have now performed four days of sound emissions, today was supposed to be the 5th day of playback but we had to postpone it until tomorrow due to the NW wind. 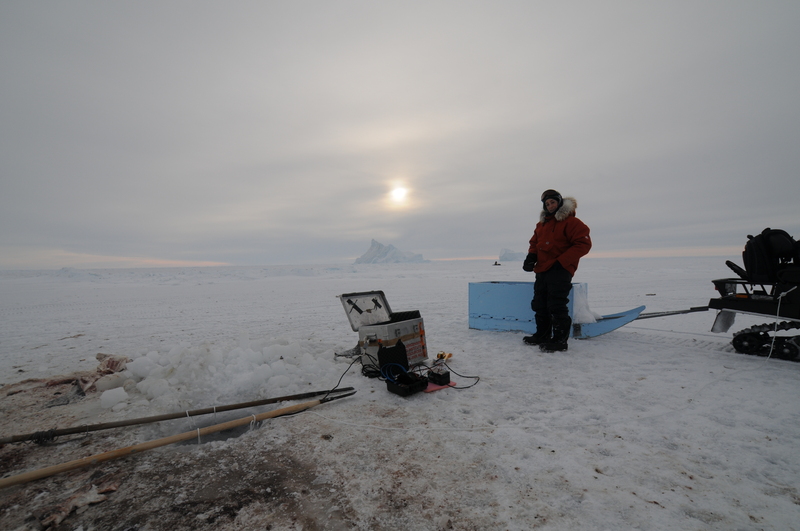 John making a hole in the ice which allows us to deploy the hydrophone and setup a temporary monitoring station while we perform the playback experiments. Making a hole in the ice it’s a matter of technique! Our playback location it’s facing west, so we would have been totally exposed to the wind and because of the wind chill factor it would have felt easily 10 or 15 degrees less than the actual -20 degrees, so -30 or -35 degrees! Having in consideration the time that it takes to setup the playback experiments from the start time (when we pack all the gear into the wagon and we are ready to leave Arctic Station with the snow mobile) until the end time (when we get all the gear indoors), it’s important to realise when it will be too cold for it. The playback station where we use a fishing hole to deploy the loudspeaker into the sea attached to the tuks. We have had some great difficulties this year in blocking the radio interference from our recording equipment. One of the reasons might be that MF radio is operating in Greenland again and Qeqertarsuaq has even got a stronger transmitter. We just seem not to be able to make the radio noise disappear more than a few moments. So now the monitoring station is running but every time we open the door to the lighthouse at Qaqqaliaq we are worried if we will again hear the news instead of the whales. We have started our other objective of this field trip, which is the playback experiment. We have now performed 2 days of playback experiments and everything went really well and as planned (not like in Qaqqaliaq..). The first day of the experiment was quite cold. Outi sitting on the control station, the position used for acoustic recordings prior, during and after the playback sound emission. Photo: J. Jakobsen. Outi, John and Laia went out of Qeqqertarsuaq, towards the west sea-ice nearby with the snow mobile and all the necessary equipment (underwater speaker, 3 tuks, rope, hydrophone, recording devices, walkie-talkies, etc). We re-used a hole in the ice that was already made by Fin and John on another day for shark fishing. 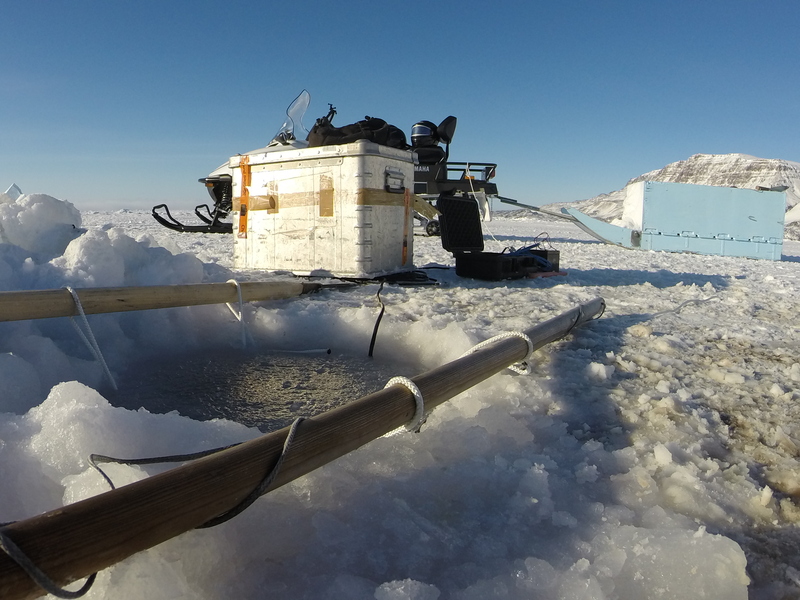 We introduced the loudspeaker into the water through the ”shark” hole in the ice and started emiting our playback sound sequence (which has been specially designed for this experiment). 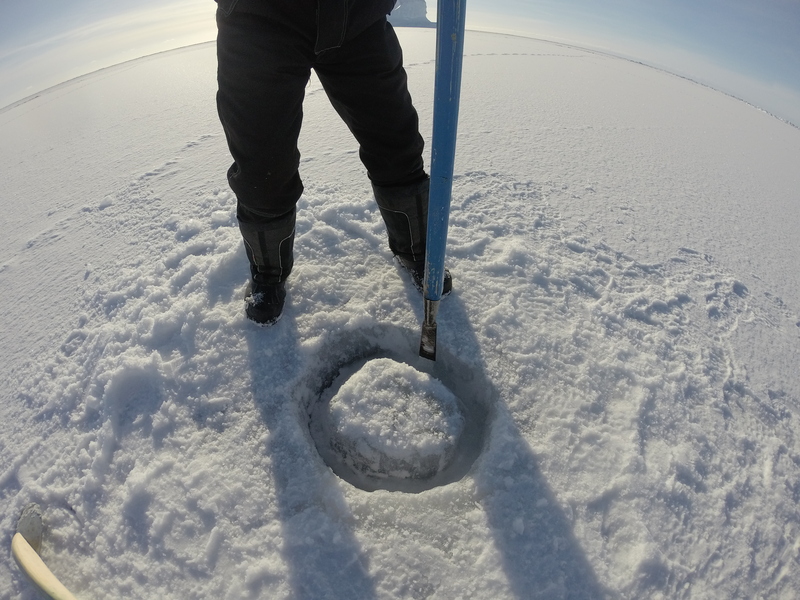 Another hole was made in the ice to deploy a hydrophone in order to make acoustic recordings prior, during and after the playback sound emission. Laia at the Playback station, the position where we deployed the loadspeaker and emitted the playback sounds. Photo: J. Jakobsen. Outi and Laia at the “shark hole” used for the playback experiments. Photo: J. Jakobsen. The second day of the experiment was luckily a very sunny and beautiful day with an amazing sunlight. 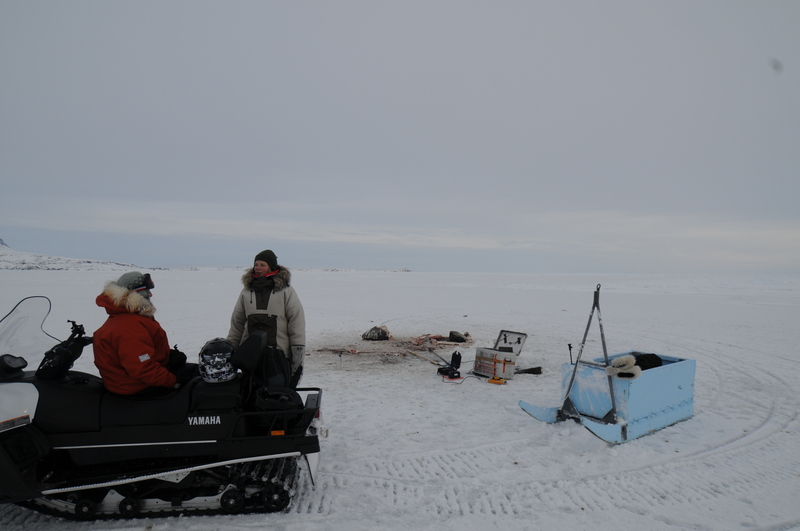 Outi, John and Laia went to the same place as we did the 1st day of playback experiments and followed the same procedure just with the slide change of deploying the hydrophone 200 meters further than 1st day and therefore having to break throught the ice with the tuk to make a new hole. Outi at the recording station, listening and enjoying the sunny day. Photo: J. Jakobsen. Laia setting the acoustic emission equipment at the “shark hole” (Playback station). Photo: J. Jakobsen. Qaqqaliaq monitoring station is showing to be more challenging this year than never before. We have though learned one thing that is different now compared with the previous years – the MF radio is operating in Greeland again after a 3 year pause. 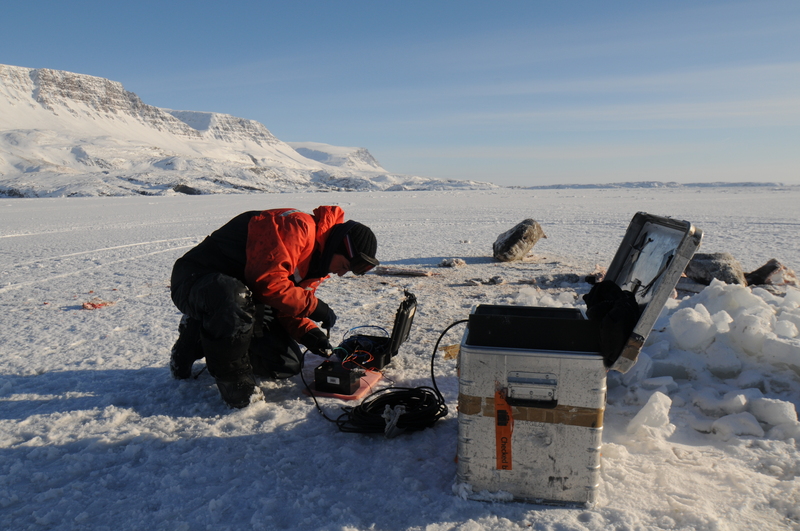 Qeqertarsuaq has also gotten a more powerfull transmitter for braodcasting these particular radiowaves – we are now thinking that this might be the core of our problem. Luckily there are a few more things left to try to shield our system against the radio interference. Early in the morning at the high tide we arrived at the cliffs and what did we see – the lost tuk from yesterday!! It had frosen upright into the ice and Laia could pick it up easily like a flower. The ice was indeed corporating better today than yesterday and with no difficulty Laia was able to deploy the hydrophone and the ground cable into the sea. But up at the lighthouse problems started. Instead of hearing just whale singing we were hearing a lot of radio. We tried everything we could think of from uncoiling the hydrophone, changing that to a new one to grounding each of the pieces of equipment to the main ground cable – but nothing could take away the news, the weather forecast and the greenlandic music. The national radiostation offers a variety of programs. Tomorrow thanks to brainstorming with Christian we will try isolating the power and signal distributor box with metal mesh and grounding that. Hopefully it will do the trick. How to drive with a snowscooter when the back gear gets stuck? After the succesful taptest at the Qaqqaliaq few days ago we were finally ready to deploy the hydrophone and start the monitoring station. It was supposed to be an epic day – and it was indeed, just in an different way. 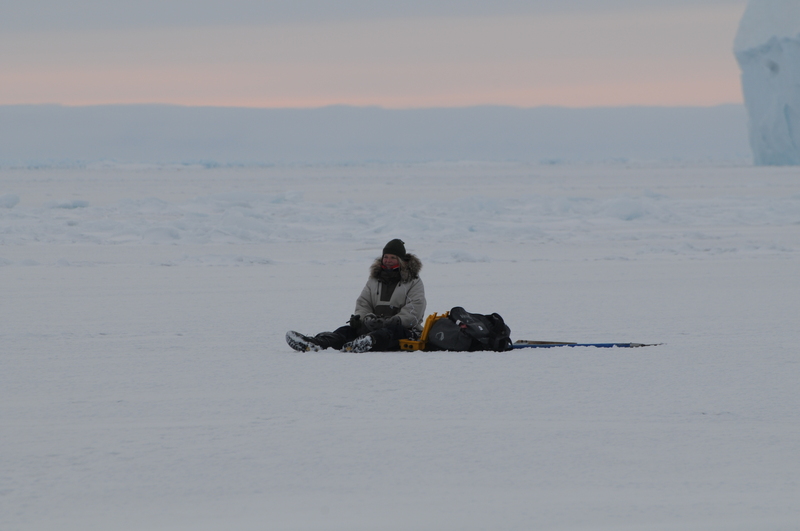 It was very difficult to get close to the sea ice and Laia had to find her inner ice-climber (secured with a rope) in order to get anywhere near to make a hole to it. Finally when on the ice foot at the edge of the sea ice, Laia put all her energy into a powerful strike with the tuk (the ice breaking spear) – and let go at the crucial moment meaning that we lost the tuk into the sea (happens to everyone at some stage when fiddling with ice but is always equally frustrating). So up again the cliffs and drive back to the Arctic Station to get a new tuk, now secured with a thin rope so that we don´t loose it again – and down the cliffs and the blocks of ice onto the ice foot again to make a new hole. The ice crampons on Outi´s boots were falling off at a regular 15 minute interval and at a moment of unmindful she fell head first on the cliffs – it turned out to be knees first but still one of those things that should not happen. By this time the water was even lower and the zone between the sea ice and the ice foot was not solid ice anymore but thick mushy slush ice which meant that the hydrophone would just float on top of it and not actually sink into the sea. After several attempts we just had to give up trying to find some clear water and decided to wait for the high tide next morning when the ice would at least be closer to where we were standing. We arrived at the Arctic Station weary and dissatisfied just to notice that half of our luggage had fallen off somewhere along the way. So back again towards Qaqqaliaq the same route we came which was taking us on some quite narrow passages between houses – and where the snowscooter suddenly tilted and almost rolled on its side. Luckily just almost but we had time to imagine each other on a evacuation helicopter to Nuuk with two broken legs. So finally almost at Qaqqaliaq we found the missing backpack and put the snowscooter on reverse in order to turn it around to finally drive home and stay there … but then the back gear got totally and utterly stuck. So the only way forward was reverse and we did that for a longer time than we care to remember until finally by a sudden and unexpected stroke of luck, the gear jumped over to drive and we were able to drive through the town like normal people. Comments Off on How to drive with a snowscooter when the back gear gets stuck? Weather is very good; sunny and not windy. Laia went to Qaqqaliaq to make some recordings with the hand held setup, together with Trine and Christian (Trine wants to write a about our research and she wants to take pictures + experience a normal day of fieldwork). This fits very well so Laia can proceed with the plan of getting new recordings. There were no holes in the ice so we made one by throwing the tuk like a spear attached to a rope through the ice. It was very difficult to aim the hydrophone into such a small hole but after many trials and very cold hands Laia manage to score the hydrophone into the hole. There are bowheads and the sound is very good. Because of the quite environment we are now recording at 30 dB gain instead of 20 dB. A new song from 2015. There is almost no soil on the cliffs of Qaqqaliaq so the earth/ground connection has to be made by running a wire from the equipment up at the lighthouse all the way down the cliffs and into the sea. We are lucky to find the remains of the old ground cable under the snow on the cliffs and attach an extension to it. Now we are ready to perform a tap test again using the 2 extension cables that we already know they were working. Fingers crossed and Yes! Both extension cables are functioning good and no radio signal is interfering the recording system. We found an old hydrophone that is working well but it’s very short, so we decided to solder it to an extension hydrophone cable in order to make it long enough to reach the water from the cliffs of Qaqqaliaq. The glue is still drying but we are hoping that it will work well afterwards!